Woah. This is some story! Hawaiian living abroad comes home to visit… after 38 years. 1915. THAT HAWAIIAN RETURNS TO SEE HIS HOMELAND ONCE MORE. After leaving Honolulu thirty-eight years ago, that Hawaiian, John Bell Wilson is his name, returned to see once again his family and homeland while he was still in good health, on the steamship Matsonia this past Wednesday, filled with shock at how the places he was familiar with in his childhood had changed. John Bell Wilson left Honolulu nei when he was a youngster of twenty-three years in age on a sailboat, because there were few steamships in his day, but it was upon a beautiful steamship that he returned to see the land of his birth and his friends, as he was shocked at the change of Honolulu from an almost nothing town which he left to a beautiful town which one admires. His eyes met up with new sights of Honolulu and ethnicities which were unfamiliar to him; and as he travelled here and there, there were no friends who he knew in his youth, except for but a few who were still living which he met up with, those friends who he went around with in those days gone by. When John Bell Wilson returned to see his homeland, he had one big thing on his mind, that was meeting affectionately with his mother, who he thought was still living, but she was not, and this left him heartbroken. Mr. Wilson was depressed at the death of his mother, being that from the time he left this land until his return, he did not write his mother; and when he asked his friends when he landed ashore about his mother, this was when he was told she had passed long ago to the other side, three years ago. He went immediately to find the grave where his mother was laid to rest, and he planned to build a memorial to her, as a show of remembrance from a thoughtless child for his beloved mother. According to the words of Mr. Wilson after he saw the scenery unfamiliar to him, he could not recall the old Honolulu, because the town had changed so much from when he left, however he did have recollections of the major streets of town. When he travelled about looking here and there, those scenes were not familiar to him, except for just a few people who went around with him and played with him in the days of his childhood. The small children he left behind were now very elderly and some of them had white hair. Ka Nupepa Kuokoa, Buke LIII, Helu 6, Aoao 1. Feberuari 5, 1915.
stepped once again on the soil of Hawaii, were J. K. Kamanoulu and East Kahulualii who work at the newspaper printing office. In the days of his childhood, he went often to the old Kaumakapili Church, and he was enrolled at Lahainaluna School, and according to him, C. P. Iaukea is one of his friends who is still living. When he left the land of his birth, he got off at Sutter County, California, and there he sought very hard until he became well off. He married his wife, and they currently have five grown children, and he provided a good home for his family. He is the one who supplies the market of Sacramento with fish and meat, and he also makes profits from the farming industry. Kalakaua was the King of Hawaii nei at the time he last saw Hawaii, and Lorrin A. Thurston was but a child. There are many people from Hawaii who have met up with him in California, and in the year 1891, in the town of San Francisco, he met with King Kalakaua there, and they dined together, drank and talked, and just a few days after that was when King Kalakaua died. Mr. Wilson is now sixty-one years old, so he was living thirty-eight years abroad, and he has not forgotten his native language, he is still fluent in Hawaiian, just as the people here are. According to him, he will spend three months staying in Hawaii before returning to his family who await him. 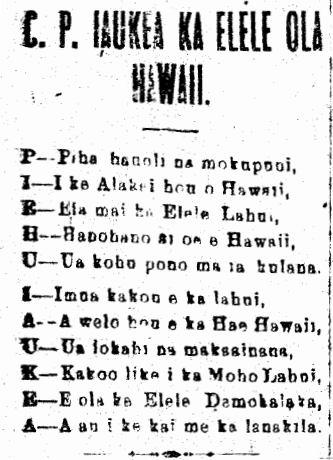 Ka Nupepa Kuokoa, Buke LIII, Helu 6, Aoao 4. Feberuari 5, 1915.